For issues relevant to BASS or MzLS imaging, consult the DR6 issues page. The column BRIGHTSTARINBLOB was not initially included in the DR7 sweeps files. In addition, the GAIA_DUPLICATED_SOURCE column in the DR7 sweeps files was initially included as type int8 rather than being passed through as a boolean from the Tractor files. The DR7.1 sweeps files were provided as an update to rectify these issues. On August 23, 2018, the randoms-dr7.fits file initially supplied with DR7 was split into smaller files in a dedicated randoms directory for ease of use. On August 23rd, 2018, the DR1 and DR2 coadd directories were removed to save space. Data from those directories is still available via FTP from the NOAO archive for DR1 and DR2. In DR7, sources in a blob that touched a bright star were forced to type=PSF and the BRIGHTSTARINBLOB column was set for these sources. However, sources for which the blob crossed brick boundaries were not forced to type=PSF. 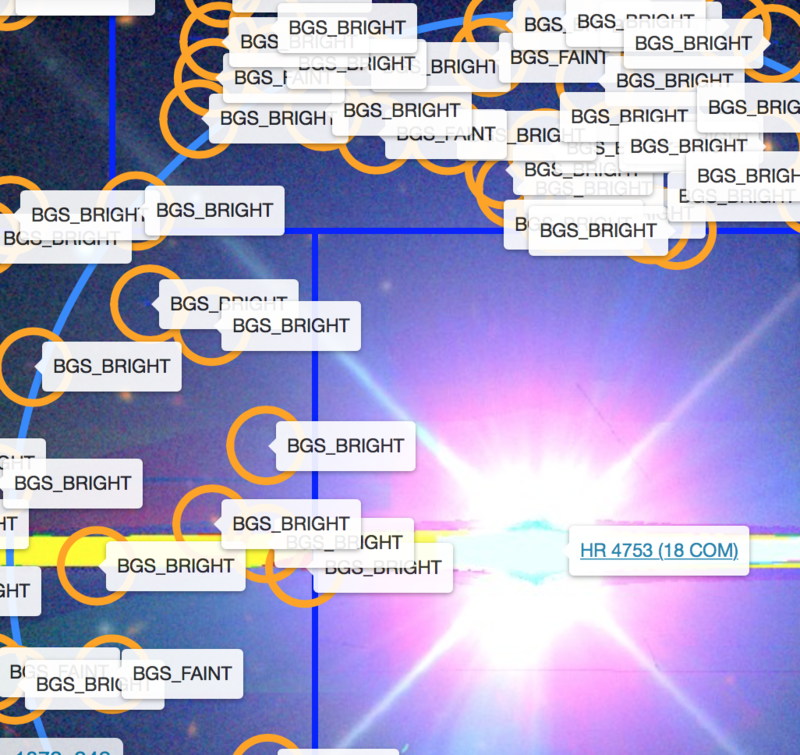 This is illustrated in the figure below, where objects labeled BGS_BRIGHT are extended sources that lie across a brick boundary that touches a bright star.